Santander (Agenzia Fides) - "Thanks to Colombia, God has listened to our prayers. We must have faith because it is always merciful", said Diana Arévalo, hearing the news of the return of her son. 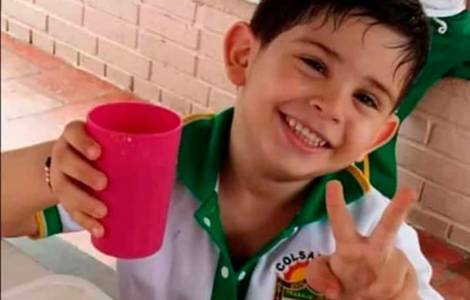 In fact, on Tuesday, October 9th 2018 Christ José Contreras, the 5-year-old child kidnapped a week ago, was released. After almost a week of imprisonment, Cristo José Contreras was released and is now with his family, as confirmed by the president of Colombia, Ivan Duque, who expressed his joy. The boy was kidnapped by two armed men last Wednesday at school. The case had mobilized all of Colombia, to the point that the humanitarian commission formed by the Catholic Church and the Office of the Ombudsman, had offered help in the search of the child in the mountains of El Catatumbo and had issued an appeal to the kidnappers for the respect for the life and release of the five-year-old child. In other cases, the Catholic Church was involved in the return of seized prisoners, but in this case it was not possible to intervene directly because the kidnappers were not known. The note sent to Fides informs that Father Jairo López Ramírez, a priest of the diocese of Ocaña, had asked to dialogue with the kidnappers, inviting rural communities to provide any kind of information to allow the rapid release.